Clarify Face Package Large ~ With Love and Co. 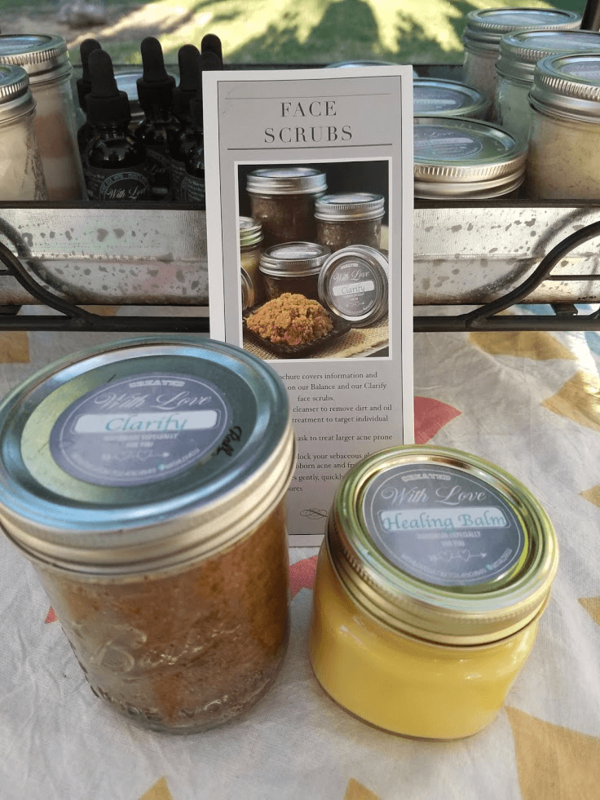 This package is a combo of our amazing Healing Balm and the Clarify face scrub. The combination of the two products is an amazing, yet affordable treatment for acne and other blemishes, normally seen on the face. It is designed for those that have already experienced the effectiveness of each and want to continue using them at a discounted price. Clarify Facial Scrub reduces inflammation and fights the prime acne and ingrown hair perpetrators like dirt, oil and pore-clogging dead skin cells with Clarify. During the day your face is exposed to endless chemicals, pollutants, bacteria, sunlight, and the list goes on. Draw those harmful materials out of your skin with our scrub. Your complexion will be thanking you for a daily detox, leaving you feeling moisturized and refreshed! Fight against acne, blemishes and stubborn blackheads. Cleanse and minimize pores, exfoliate dull/dead skin cells and moisturize to the base of your skin with each wash. Works to brighten skin tone, eliminate dry skin and irritations. Reduces oils and skin impurities while boosting skins immunity to increase wound healing. Our beautifying scrub ensures your skin will be left cleansed, soft and smooth – never tight or irritated. Our natural exfoliating scrub will give you a glowing, beautiful complexion. Our Healing Balm Our is a special blend of 11 natural oils and butters and several vitamins, designed to heal the skin, maintain that youthful appearance, and provide a protective layer that will last throughout your day. Our blend of ingredients is designed so that each works together to penetrate the skin and replenish the ability to maintain moisture. This brings back the firmness, pliability and plumpness of a more youthful time. unclog your razor more often. don’t mind having an extra bit of character.